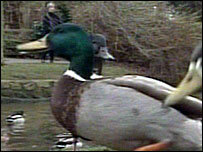 People in Leicester have been warned they may face a fine for feeding ducks too much food. The city council is introducing the £80 fine to try to reduce the amount of scraps being left in parks. Officials say an increasing amount of unwanted food is being dumped in the parks, which attracts vermin. The authority is now putting warning signs up in the city's parks. Persistent offenders will be fined under the Environmental Protection Act. Barry Ingram, senior parks officer said: "There's absolutely nothing wrong with people feeding the birds. "What we're taking issue with is the excessive dumping of large amounts of food that is left to rot on the ground and attracts vermin. "We want to educate people to feed the birds reasonable amounts just as generations have done before."